The AFL-CIO and several civil rights organizations said Wednesday they would oppose Supreme Court nominee Samuel Alito's confirmation in the Senate. "It's clear that his judicial philosophy is at odds with the interests of America's working families," AFL-CIO President John Sweeney said in a statement. President Bush nominated Alito, a federal appeals court judge, to replace the retiring Justice Sandra Day O'Connor in October after White House counsel Harriet Miers withdrew her nomination. Alito continued his courtesy visits to senators on Wednesday, meeting with Sen. Byron Dorgan, D-N.D.
Dorgan called his meeting with Alito "a good first opportunity to sit down and get to know him on a one-on-one basis." Dorgan said he would wait until after Alito's Jan. 9 confirmation hearings before the Senate Judiciary Committee to decide whether to support the nomination. The National Association for the Advancement of Colored People, the NAACP Legal Defense Fund, the Mexican American Legal Defense and Educational Fund and the AFL-CIO all opposed President Bush's first Supreme Court nominee, now-Chief Justice John Roberts. 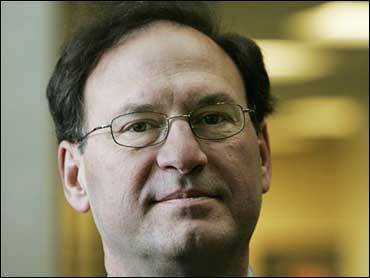 Several environmental groups also were expected to announce their opposition to Alito next week. Alito will continue his courtesy visits on Thursday, stopping by the offices of the two Arkansas Democrats, Mark Pryor and Blanche Lincoln. He may bump into some of his former clerks, as a group of them plan to hit Capitol Hill to lobby for Alito's confirmation.